Post-apocalyptic novels aren’t really my thing; they aren’t the type of books I’d pick up at the library and be particularly interested in. 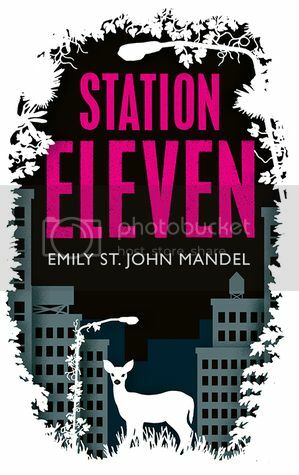 So when I came to collect Station Eleven, a book I had reserved at the library some time ago, and I read the synopsis, I realised that this is exactly what it was – a post-apocalyptic novel. What made me reserve it in the first place, I have no idea, but I was intrigued by the idea of a story in which all the characters were connected by one man, Arthur Leander, who dies on stage at the very start of the novel. The apocalypse in this case comes about as the result of a flu pandemic. The Georgia Flu, as it is known, spreads out of the European country that bears its name, and swiftly wipes out 99.99% of the population. Arthur Leander doesn’t live to witness this destruction of civilisation, he dies the night that hospitals start to realise they have a disaster on their hands. Jeevan, a paramedic in training who tries to save Arthur, is warned by a doctor friend about the impending crisis, and manages to survive by stockpiling food and water and sealing himself inside his brother’s flat. While it seems, from the start of the novel, that Jeevan is going to be our protagonist, that actually turns out to be Kirsten. Eight years old at the start of the novel, she is on stage as a child actor when Arthur dies, and twenty years later we catch up with her as she is travelling the country (though by now, there are no borders, and therefore no countries) with The Travelling Symphony, a band of actors and musicians who move from settlement to settlement, performing Shakespeare. The narrative constantly switches between the ‘present’, Year Twenty, and the past, where we delve into Arthur Leander’s life, and discover how all of the central characters are connected to him. Mysteries are presented, with clues to their answers planted and answered further down the road. They mysterious character of ‘the prophet’, a religious fanatic who sows fear wherever he treads, has a dog named Luli – a name Kirsten recognises from the old comic books she carries. Nobody else has ever heard of Station Eleven, and she’s sure they are limited edition copies, so what is the prophet’s connection to them? This is a book that will really make you think; if you’re anything like me you’ll have a momentary panic that this kind of disaster is all too real, and could happen far too easily. You’ll wonder what you’d miss most if you survived into Year Twenty. You’ll think about the things that seem as though they are insignificant now, but could provide you with unspeakable comfort after everything and everyone else is gone. I think one of the reasons that I loved Station Eleven so much is that Mandel is committed to the idea that while civilisation might come perilously close to extinction, the importance of art will endure. The Travelling Symphony’s motto, “Because survival is insufficient” might come from Star Trek rather than Shakespeare, but that makes it no less enduring.